Riley Hancey, 19, of Park City, Utah, received a double lung transplant at the Hospital of the University of Pennsylvania late last month. He was denied a transplant by the University of Utah Hospital after testing positive for marijuana. 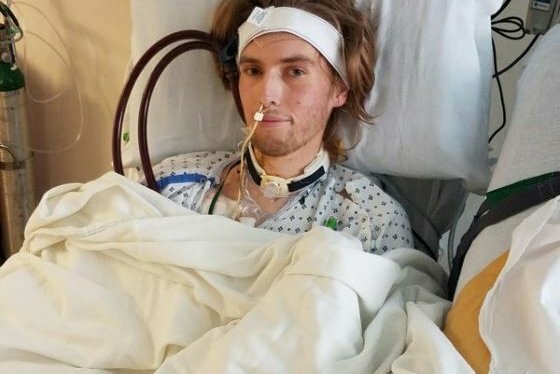 A Utah teenager reportedly received a double lung transplant in Philadelphia last month after he was denied one by a Utah hospital because he had used marijuana. Riley Hancey, 19, of Park City, Utah, is recovering at the Hospital of the University of Pennsylvania, where he underwent organ transplant surgery on March 29. Hancey spent more than two months hospitalized at the University of Utah Hospital after a bout with the flu led to pneumonia and a lung infection, according to his fundraising page on the YouCaring site. His lungs lost all gas exchange function, forcing him to rely on a tracheotomy and an ECMO procedure to provide oxygen to his blood. But the University of Utah Hospital denied Hancey a spot on its transplant list because he tested positive for THC, the primary psychoactive compound found in marijuana, Mark Hancey, Riley's father, told KSL.com. That sent the Hancey family searching for a hospital that would perform the transplant. In February, Penn Medicine's transplant program agreed, according to the YouCaring page, which is helping Hancey's family cover medical bills. Penn Medicine does not comment on specific patients' cases, corporate director of communications Holly Auer wrote in an email. But she said its transplant program "routinely handles the most complicated transplant patients, and we assess each situation on a case-by-case basis." "When individuals are referred for transplant evaluation here, all aspects of their medical status are reviewed, including other medications or drugs they may take or have taken in the past," Auer said. "These types of evaluations are standard nationally, but the ultimate decision about whether a transplant is appropriate is made on an individual basis, in close concert with the patient and their family to ensure the best possible outcome." The University of Utah Hospital did not immediately respond to a request for comment. But hospital officials previously released a statement to KSL.com saying they follow international guidelines for transplants and evaluate each case individually. "We do not transplant organs in patients with active alcohol, tobacco or illicit drug use or dependencies until these issues are addressed, as these substances are contraindicated for a transplant," that statement said. Mark Hancey told KSL.com that Riley had smoked marijuana in the past, but questioned its impact on his lungs. "Riley did smoke marijuana on Thanksgiving night with his friends," Hancey said. "It's not like he's a smoker for 30 years and (had) deteriorating lungs because of that." His son is doing well following the transplant, but will remain at HUP for a year as he recovers, Mark Hancey told KSL.com. Prior to his illness, Riley was a healthy teenager who engaged in sports, loved to travel and worked for his brother at a ski resort, according to his YouCaring page.